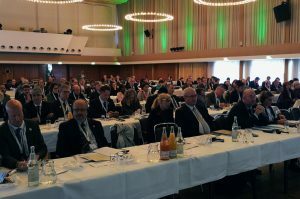 On the occasion of International Green Week and the Global Forum for Food and Agriculture 2019, the World Future Council is hosting a panel discussion on Friday, January 18, 2019 in Berlin. 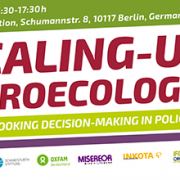 The aim is to promote the strengthening of agroecology in politics and practice in Germany and beyond – the theme of this year’s Future Policy Award. Greetings from COP24’s 4 per 1000 Initiative Day! 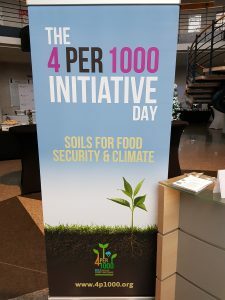 On the occasion of the UNFCCC COP24 (December 2018) in Katowice, Poland, the international “4 per 1000 Initiative: Soils for Food Security and Climate” organised, in partnership with the University of Silesia, the second 4 per 1000 Initiative Day on 13 December 2018. An important event to which the World Future Council was invited to speak. Numerous ministers and renowned personalities took the floor to underline the importance of soil protection and how improved soil health can absorb greenhouse gases and thereby fight climate change. 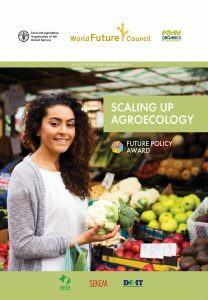 World Future Council’s Climate Director Rob van Riet underlined the need to advance urgently the transition towards sustainable food systems and presented the winners of Future Policy Award 2018 – exemplary policies that work towards this transition and scale up agroecology. After working in 2017 with the United Nations Convention to Combat Desertification (UNCCD), the World Future Council had organized this year’s Future Policy Award in partnership with the Food and Agriculture Organization of the United Nations (FAO) and IFOAM – Organic International. In 2017, the 4 per 1000 Initiative that was launched in 2015 during the Paris Climate Change Conference by H.E. 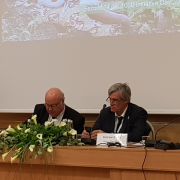 Stéphane Le Foll, then French Minister of Agriculture, AgriFood and Forestry, won the Future Policy Vision Award as it created an unprecedented attention to the role soils play for food security and climate stability. https://www.worldfuturecouncil.org/wp-content/uploads/2018/12/Rob-von-Riet-at-4per1000-COP24-Event-2018.png 400 1049 Miriam Petersen https://www.worldfuturecouncil.org/wp-content/uploads/2019/04/wfc-logo-en-without-band-website-bigger-1-300x115.png Miriam Petersen2018-12-13 17:44:362018-12-13 19:19:45Greetings from COP24’s 4 per 1000 Initiative Day! 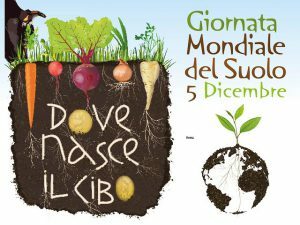 In order to stress the importance of environmental and soil protection, the United Nations celebrate this indispensable natural resource every year with World Soil Day, on 5th December. Celebrations are taking place around the world and so they do, for instance, in the Republic of San Marino, to which the World Future Council was invited to speak. Soil health is fundamental for a healthy food production. It provides essential nutrients, water, oxygen and support to the roots, all elements that favour the growth and development of plants for food production. 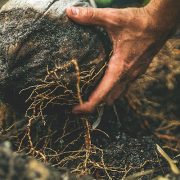 The soil hosts a big community of diverse organisms that improve the structure of the soil, recycle essential nutrients, helps to control weeds, plant pests and diseases. Another important aspect is that when soil is healthy, it contributes to mitigate climate change by keeping or increasing soil organic carbon. Soil is the basis of food systems as well as the place where all plants for food production grow. For that reason it is extremely important to preserve soils and to start a global cultural movement which returns to soils the primary importance that they deserve. What does the World Future Council to promote soil protection? The World Future Council identifies and promotes successful solutions to protect our soils. Our Future Policy Award, which is the world’s only prize for exemplary laws and policies, was awarded in 2009 on the topic of Food Security. The Gold Award went to the outstanding legislative programme from the Brazilian city of Belo Horizonte, which promotes urban and community-based agriculture and protects thereby precious soils. 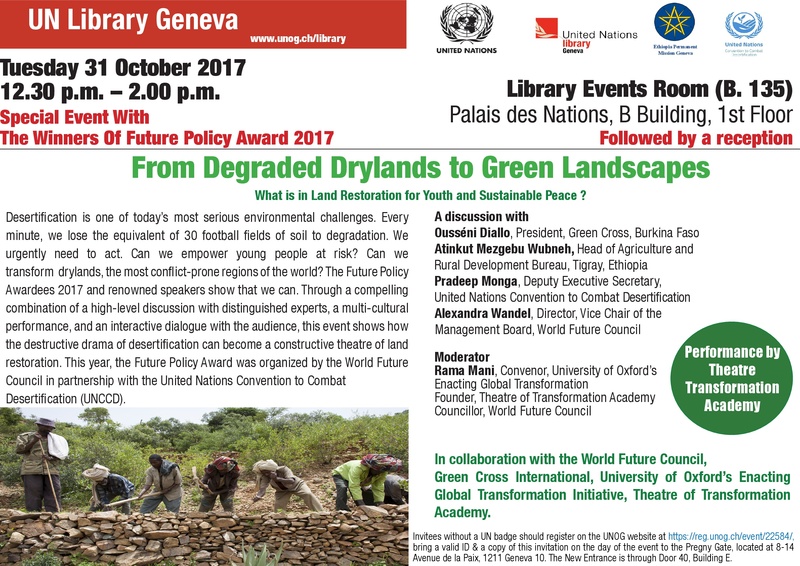 Our Future Policy Award 2017 was awarded in the area of ​​desertification and land degradation, in close cooperation with the United Nations Convention to Combat Desertification. 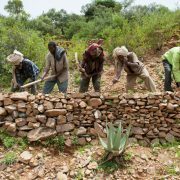 The Tigray region in Ethiopia which has rehabilitated degraded land by mass mobilization and on a massive scale, won Gold Award. Since 1991, soil and water conservation measures have been carried out on 960,000 hectares, and despite a growing population, the region has thus achieved reduced soil erosion, better water infiltration and improved soil productivity. Recently, we celebrated with our Future Policy Award 2018 the world’s best policies for scaling up agroecology in partnership with the Food and Agriculture Organization of the United Nations (FAO), and all winning policies from Brazil to India, from Denmark to the USA, from Senegal to the Philippines show how to successfully protect soils and biodiversity, increase productivity, making farming more climate resilient and profitable for those who do the job. The World Future Council engages to show what is possible, how much more you can achieve if you invest sustainably and not just short-term ideas. It is extremely important that these forward-looking solutions are increasingly taken up and disseminated. Because still we have the possibility to limit the globally rapidly spreading problems. Please help us and support our work for healthy soils! What happens today in San Marino? Ingrid Heindorf, World Future Council’s Geneva Representative, will both address San Marino’s Presidency (Capitani Reggenti), stressing the urgency to protect our soils from land degradation. Thereafter, from 11 am onwards, they will participate in a Roundtable in Palazzo Graziani to present solutions on how to best advance soil protection in San Marino and to discuss with renowned experts, relevant associations of San Marino as well as the general public. You are interested in finding out more? Have a look here or read our recent news posts on the Future Policy Award. Help us and donate to our work! https://www.worldfuturecouncil.org/wp-content/uploads/2018/12/Featured-image-for-website-1.png 400 1049 Miriam Petersen https://www.worldfuturecouncil.org/wp-content/uploads/2019/04/wfc-logo-en-without-band-website-bigger-1-300x115.png Miriam Petersen2018-12-05 11:06:012019-02-28 15:42:21Why is soil so important? On Thursday 29th November, Berlin provided a solace of winter sun after a week of heavy-hanging weather to welcome World Future Councillor and world-renowned environmental activist, Prof. Dr. Vandana Shiva, and the Director of the World Future Council, Alexandra Wandel in the capital’s Parliament Complex. They were invited by Member of Parliament, Renate Künast, former Minister for Food and Agriculture to discuss the agro-political situation in India, the world’s first 100%-organic state and Gold-winner of the Future Policy Award 2018, Sikkim, as well as the road-map to sustainable global agriculture. 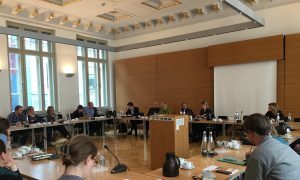 In a simple yet elegant conference room, the Honourable Künast welcomed her guests and 30 audience members from the German Parliament, European environmental institutes and the general public, and opened the discussion. The conversation quickly turned to agriculture in India. As a country whose agricultural face was profoundly transformed under the Green Revolution of the mid-20th Century, India is a notable example of the extreme conflicts and contrasts in the current global food system. 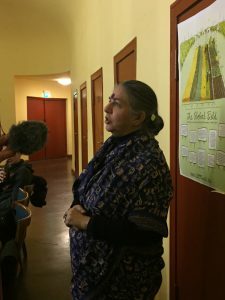 Councillor Shiva described the horrors incurred by input-intensive agriculture in the country, which she has repeatedly encountered across four decades of environmental activism. An ongoing suicide-epidemic of hundreds of thousands of debt-ridden farmers, a ‘cancer train’, from the Punjab the Rajasthan, and a youth driven from agriculture and into drug abuse were some of the images she invoked. But the old techniques based on an old reductionist “lego-logic” have been recognised and, by some, reversed in the most radical and inspiring ways. Over the past 45 years, Sikkim state in the Himalaya Region of India has made the transition to 100%-organic agriculture. Model farms, farmer field schools and a total ban on non-organic food-products have been instrumental in training over 65,000 farmers across 75,000 hectares into sustainable, fully-organic methods. World Future Council Director Wandel described how this unprecedented and entirely-successful transformation has earned the region countless benefits for its farmers and the health and well-being of the local people, as well as a 50% boom in tourism and recognition on the global stage. It is for this tireless work in organic agriculture that Sikkim was awarded the Gold Future Policy Award 2018 at the ceremony in front of 170 heads of state in Rome. Whilst 51 other nominations to the post were extensively researched and other policies from Denmark, Ecuador and Brazil received a Silver recognition, Sikkim’s efforts proved by far by the most exemplary. As part of her work with the Parliamentary Group on India, Hon. Künast recently had the opportunity to visit Sikkim experience their ground-breaking (and ground-making) work first-hand. She said she was wholly impressed by how the state uses public money to provide possibilities and livelihood dignity for its citizens in organic agriculture. Their valuing of traditional knowledge fuses with the goodness of the people in an atmosphere of respect for one another and the Earth. A second audience member asked how Sikkim was perceived at national level – is this the dawn of an organic India? There certainly exist other positive examples, for example, efforts in the Northern state of Ladakh to become organic. However, at national level, major obstacles remain. Vital here is the ongoing commitment to a sustainable vision by all spheres of society. The Director of the World Future Council Alexandra Wandel mentioned that unfortunately not a single German law was nominated for the Future Policy Award on Scaling Up Agroecology and that parliamentarians were invited to have a look at the awarded policies, including the organic policy of Sikkim and also the silver award from neighbouring country Denmark which received the Future Policy Silver Award and has the highest share of organic products in the world. The event in the German Parliament came a day after the World Future Council and Councillor Shiva were invited to celebrate Bread for the World’s (Brot für die Welt) 60th anniversary in the German Theatre, and proceeded two exciting events at the historic Babylon Cinema in Berlin’s Mitte district. 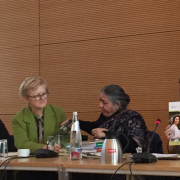 The first – “Vision for Agriculture 2050”   – was a debate between Councillor Shiva, Norbert Lemken, Director Agricultural Policy at Bayer and Prof. Dr. Sonoko Dorothea Bellingrath-Kimura of the Leibniz Centre for Agricultural Landscape Research (ZALF). As the audience outed their respective support and outrage, the debate raged over the science behind chemical inputs, the capacity to feed the world and the morality behind this monumental task. After a short break where audience members could inform themselves with Councillor Shiva’s literature and speak with Liam Innis about the World Future Council and the Future Policy Award, the night continued with the screening of “SEED: The Untold Story” . The film, wherein Councillor Shiva is a protagonist follows the rich and treasured history of Earth’s 12,000 year-old food legacy, which continues to be threatened to extinction by – and fight back against – an all-encompassing agro-industry. Travelling through Tigray, northern Ethiopia is a mind blowing experience for anyone with an eye for land management. Hill after hill after hill is terraced. Stones are piled up in long benches to stop water flowing off. All of this back breaking work has been done by local communities over the past 30 years. 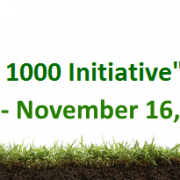 On the occasion of the UNFCCC COP 23 (6-17 November 2017) in Bonn, the international “4 per 1000 Initiative: Soils for Food Security and Climate” (Future Policy Vision Award) organized, with the support of the German Federal Ministry of Food and Agriculture (BMEL) and the German Federal Office for Agriculture and Food (BLE), the 4 per 1000 Initiative Day in Bad Godesberg on 16 November 2017. Following a warm welcome by Dr Hermann Onko Aeikens, German State Secretary of Food and Agriculture (representing Federal Minister Christian Schmidt), and Dr Ibrahim Mayaki, Chairman of the 4 per 1000 Consortium, Prof. Rattan Lal, Chair of the International Union of Soil Sciences, underlined in his inspirational speech that soil depletion, increased salinization, recurring drought and perpetual hunger are just as real threats to global peace and security as weapons of mass destruction. Full house of the 4 per 1000 Initiative Day in the city hall of Bad Godesberg. Numerous ministers and renowned personalities took the floor to restate their support for the 4 per 1000 Initiative, including agriculture ministers from Spain, France, Hungary and Tunisia, and representatives from FAO, UN Convention to Combat Desertification (UNCCD), CGIAR, GEF, Prince Albert II of Monaco Foundation, OIV, CIHEAM, INRA, IUCN, BAIF, and Danone. The meeting continued with reports on the work of the Scientific Technical Committee, which developed orientations for an international research and scientific cooperation programme as well as reference criteria and indicators for project evaluation. After the lunch break, Dr Paul Luu, Executive Secretary of the 4 per 1000 Initiative, presented amongst others the Initiative’s new members and partners, its activities in 2016-2017, its brand-new website and the launch of the collaborative platform, the 2018 roadmap, budget, communication strategy as well as the dates of future meetings. 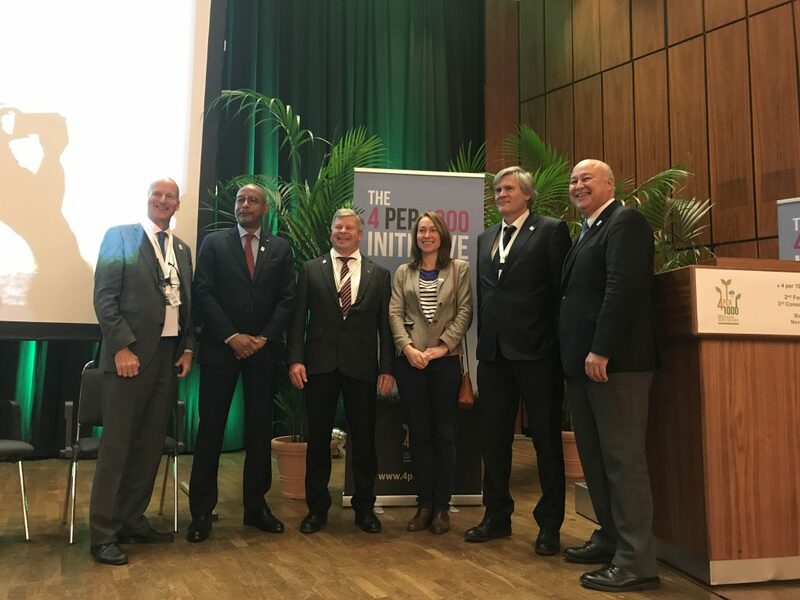 Prof Barron Orr (UNCCD), Dr Ibrahim Mayaki (NEPAD), Dr Wolfgang Zornbach (BME), Ingrid Heindorf (World Future Council), Stéphane Le Foll (former French Minister of Agriculture, AgriFood and Forestry), and Dr Paul Luu (Executive Secretary of the 4 per 1000 Initiative). 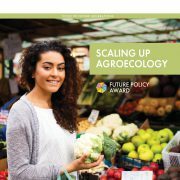 Following a report about the UNCDD COP13 by Prof Barron Orr, Ingrid Heindorf from the World Future Council presented the Future Policy Award 2017 that had been organized this year in partnership with the UNCCD and among whose winning policies was the 4 per 1000 Initiative. Launched in 2015 during the Paris Climate Change Conference by H.E. Stéphane Le Foll, then French Minister of Agriculture, AgriFood and Forestry, the Initiative won the Future Policy Vision Award 2017 as it created an unprecedented attention to the role soils play for food security and climate stability. During his conclusions of the day, the Initiative’s Chair shared also the promising news that U.N. climate talks in Bonn broke a long stalemate on agriculture (Thomson Reuters Foundation), which could trigger more sustainable government policies to support farmers. The World Future Council brings the interests of future generations to the centre of policy-making. Its up to 50 eminent members from around the globe have already successfully promoted change. The Council addresses challenges to our common future and provides decision makers with effective policy solutions. In close cooperation with civil society actors, parliamentarians, governments, business and international organisations the World Future Council identifies “best policies” around the globe. The World Future Council is registered as a charitable foundation in Hamburg, Germany. 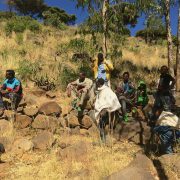 What is in Land Restoration for Youth and Sustainable Peace? 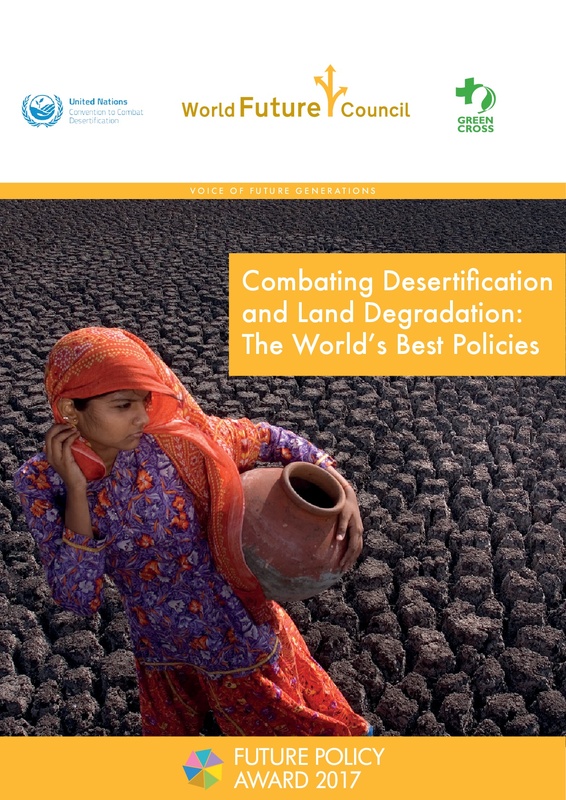 Desertification is one of today’s most serious environmental challenges. Every minute, we lose the equivalent of 30 football fields of soil to degradation. We urgently need to act. Can we empower young people at risk? Can we transform drylands, the most conflict-prone regions of the world? The Future Policy Awardees 2017 and renowned speakers show that we can. Through a compelling combination of a high-level discussion with distinguished experts, a multi-cultural performance, and an interactive dialogue with the audience, this special event shows how the destructive drama of desertification can become a constructive theatre of land restoration. This year, the Future Policy Award was organized by the World Future Council in partnership with the United Nations Convention to Combat Desertification (UNCCD). For those without an access badge, registration for this event is obligatory. Interested participants are invited to register online before 31 October 2017. 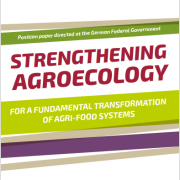 The negative effects of industrial agriculture have long been clear, and agroecology offers a multitude of solutions for the fundamental transformation of the agri-food system. 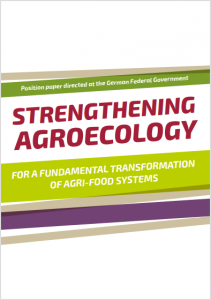 The position paper presents these solutions and is supported by the World Future Council and many other important actors of the agroecology debate. In this brochure, we present the winning policies of our Future Policy Award 2018. In partnership with the Food and Agriculture Organization of the United Nations (FAO) and IFOAM – Organics International, the 2018 Future Policy Award highlights policies that scale up agroecology, contribute to the protection of life and livelihoods of small-scale food producers, ensure sustainable food production systems and implement climate resilient agricultural practices. We seek to inspire lawmakers worldwide with these exemplary, award-winning policies, and hope to see their key elements being spread and implemented in the months and years ahead. In this brochure, we present the winning policies of our Future Policy Award 2017. 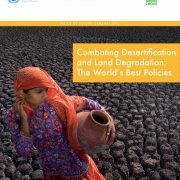 In partnership with the United Nations Convention to Combat Desertification (UNCCD), this year’s award celebrates laws and policies that successfully tackle land degradation, and contribute to the protection of life and livelihoods in the drylands. Policies score highly in the Future Policy Award evaluation not only by advancing the sustainable use of resources but also by addressing equity, the eradication of poverty, community participation, and the peaceful resolution of conflicts. We seek to inspire lawmakers worldwide with these exemplary, award-winning policies, and hope to see their key elements being spread and implemented in the months and years ahead.